Please to introduce you this Friday Feature Blogger Gloria From The Nerdy Girl News. You may have seen Gloria around the blogging community. I came across Gloria randomly one day and immediately loved what she was wanting to get across through her blog. Gloria is a huge mental health advocate as an individual who deals with her own mental health. Gloria found comfort in anime and uses her love of this medium and blog to help others – speaking through her personal experiences. Gloria is a blogger I only have the most utmost respect for in which she does and ya’ll all should check out her amazing blog !! How To Gain Followers For Your Blog? – Very useful article of gaining followers for your blog using pinterest, super interesting. Lita: Lucky number two for this Friday feature Gloria, I’ve been falling behind miserably. But thank you for letting me interview you. Your blog is such a fun one I came across late last year, please tell us how Nerdy Girl News came about? Was there any influences that made you start your blog? The pleasure is all mine! I’m honoured you even thought of my little blog. It started off as a way to get my theories and ideas out on certain anime shows and kinda took off from there. Writing is a way to get your voice out there and be heard without yelling and I really hate talking out loud. Lita: Through your blog I noticed you are a advocate of mental health and have expressed your dealings of anxiety. Has blogging become a stress relief for yourself and along with anime itself? How much does anime and blogging mean to you? It really has. Writing was always an escape for me as a child and a teen. Even now, as an adult, it still helps me sort out my thoughts and emotions. Mental Health is something I feel so strongly about. So many people shy away from talking about it or admitting that they deal with anything. I’m here to speak up for those that can’t. To show them that there IS a way to still be happy despite life kicking us in the face. Anime and blogging mean the world to me. I can see myself in certain anime characters or relate to some of their emotions. It can help me deal with whatever the issue is at the time. And if it doesn’t solve it, it can at least make me not feel as alone. The best part about writing is there is ALWAYS fan fiction. So if you don’t like the ending, you can always rewrite it. I wish reality could be like that sometimes. Lita: Couldn’t help but notice yourself loves pinterest and as you mentioned in a recent piece of how to gain followers. Has this platform had a profound effort in gaining followers? What drives you in wishing to sharing this information with other bloggers? I like a person who likes to help a blogger in need!! Pinterest has been HUGE in gaining followers. Even if it hadn’t though, I would still use it. I was using Pinterest on my personal page for YEARS before I started blogging. It’s addicting. Some people like Reddit or Tumblr, I’m on Pinterest ALL the time. I started to share the information once I saw that there were actually a lot of anibloggers out there. When I first started blogging, I didn’t know of any. Now I want to share all the info that I wish I had known when I first started. Anytime someone has a question, I’m always there to help out. Lita: It’s clear from your blog you put so much work into it do you see yourself doing this still in five years time? If so what would you like to achieve then? You bet! There will always be new anime coming out there and I’ll be there to make up or prove those crazy theories. Not to mention, see what anime characters are dealing with what mental health issues and how to best solve them. I think I’d like to expand more and try my hand at Youtube videos but I’m still working on that. In the meantime, I’ll be watching more anime, reading more books and drinking all the tea. 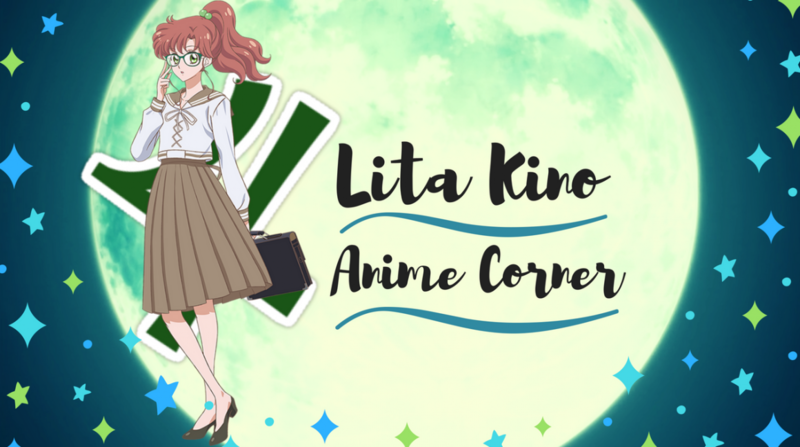 Lita: Nerdy Girls News is all about the anime and cartoons. Are there any other pop culture areas you think you’ll dive into? If so what would they be and can we expect to see in the future from you? For now, I don’t think so. Blogging is better when you have a niche and I wouldn’t want to add something else to mine. Possibly cosplay but I tried that before and couldn’t get into it as much as actually writing. I’ve thought about a featured artist column but I’m still considering it. Any news that comes up, ya’ll will be the first to know! Lita: From the time you first started up your blog, how have you found the blogging community so far? Do you find it to be an engaging platform more so than others? The community is amazing. I was shocked to see how quickly everyone was there to help or answer questions. It shocked me at just how large the anime community was for bloggers. I honestly had no idea. Twitter has been the best platform for it and I’ve made some great friends through it! Lita: I ask this question to everyone I interview in some form but As blogger to blogger is there any advice you’d like to pass on to fellow bloggers or writers out there about blogging or writing in general. Anything that is important to you that you’re always telling others? Don’t give up. The first year is the hardest when you’re building your blog. Whether you’re growing your following or trying to actually make money off of it. I’ve been there and you can’t give up. There is always something to learn and room to grow. As for something important, it’s always been my motto so of course, I’ll say it now: Keep Smiling! Biggest thankyou to Gloria for letting me interview her for my Friday feature series, which is making it’s attempt to return slowly. Bare with me. Lita takes on too much crap but were here now, I’ve learned this all that matters. Look forward to more of these when they come out!! Brilliant post and interview Lita!! !